Goodyear Heights Baptist Church was organized on May 15, 1932. Reverend H.C. Tarbush was the first pastor. The Church was located and first known as Rogers Street Baptist Church. It was later sold to Sequoit Spinning Mill and more property was purchased on the corner of Avenue A and Henry Street and the name was changed to Henry Street Baptist Church. In April of 1959, Henry Street Baptist Church was sold to Union Baptist Church on South 6th Street. Property was then purchased on Piedmont Highway at the end of the four-lane for a new Church. Groundbreaking services were held on Easter Sunday, 1960 and construction began immediately under the leadership of Rev. Jimmy Kay. On June 26, 1960 in a special called business meeting the Church voted to change its name from Henry Street Baptist Church to Goodyear Heights Baptist Church. 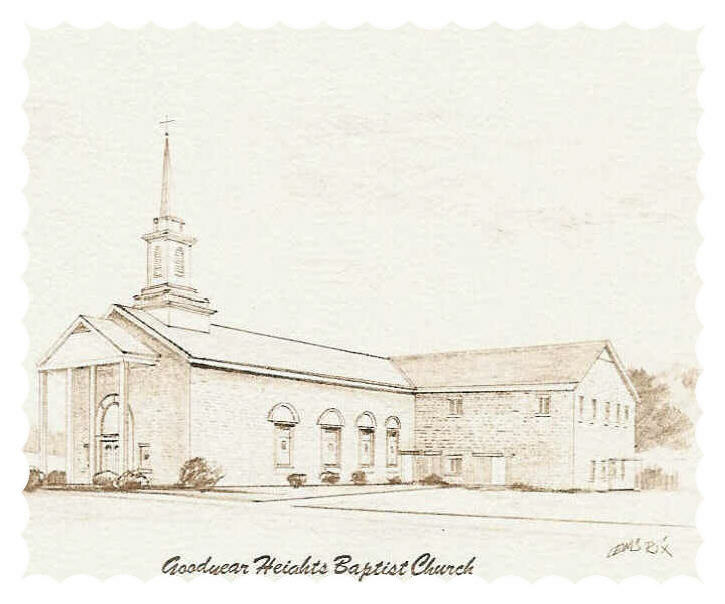 Upon completion of the new fully air conditioned sanctuary, the first service was held on August 7, 1960 with Sunday School at 9:45 and Morning Worship at 11:00 – Evening Worship at 7:00 p.m.
On September 1, 1965 plans were presented to the Church for a pastorium to be located adjacent to the parking lot. The first pastor to reside in the new home was Rev. Barney Ferguson and his family. In 1985 the Church voted to completely remodel the present sanctuary. Work began in June and the first service was held on Homecoming Sunday, August 4, 1985 in the new sanctuary. In December 1996, plans were presented to the Church for building a Family Life Center that would hold the Church offices, Sunday School Rooms, Full Kitchen, Gymnasium and Fellowship Hall. In the January 1997 Business Meeting the Church voted to begin the construction under the leadership of Rev. Tommy Ferguson. Alford Construction Company was contracted to build the building. A special Ground Breaking Service was held on April 13, 1997. The new building was completed in the Spring of 1998. In the Spring of 2002, the Church had a special dedication service for the newly installed flagpole and memorial marker that was installed in honor of the Veterans and active Military in our Church and in memory of the tragedy of September 11, 2001. In early 2005, the Church started construction on a new wing of Sunday School Rooms and storage space. This new construction was completed around the first of 2006.